In October 2017, Intuit introduced Automated Sales Tax (AST) for QuickBooks Online (US Region) that automatically calculates sales tax on transactions. With this change, Wise-Sync and ConnectWise had lost control over the set sales tax rate used, with rates and calculations driven by the customers state of where the product or service is being delivered; consistent with state tax calculation. Click here for more information about how QBO calculates sales tax. In a nutshell, the sales tax can no longer be applied to invoices by users to an invoice in QBO, rather it is calculated for you. The wrong State Tax is allocated to transactions (in ConnectWise). Wise-Sync partners on the Sync Ninja plan, that signed up to QuickBooks Online on or after November 2017 and are using the Automated Sales Tax Centre are able to take advantage of the new Override Sales Tax Level feature. 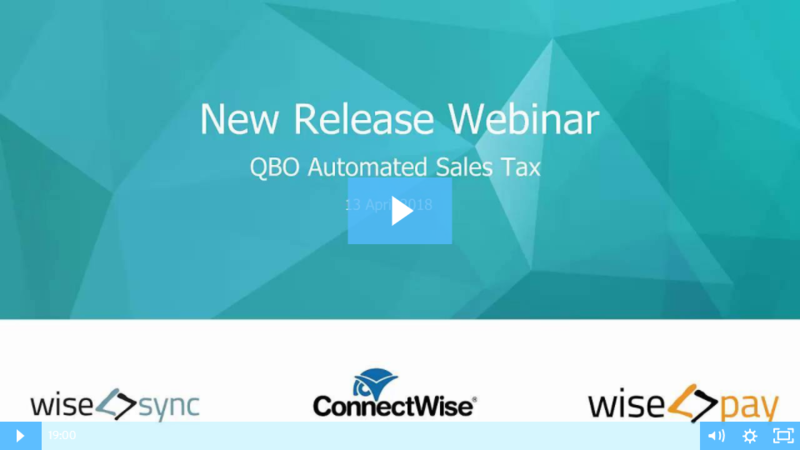 Please click here for more information on this feature which gives partners the choice to override the sales tax applied by QBO with the sales tax applied in ConnectWise. View our Release Notes or watch the Recorded Feature Release Webinar.